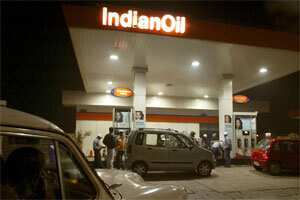 New Delhi: State-run firms will not raise petrol prices in the current fortnight, despite losing about a rupee on the sale of a litre of the fuel, a government source said on Friday, as impending state polls leave little political room for such a move. Records lows for the rupee, the worst performing currency in Asia so far this year, has added a sense of alarm to concerns about the continent’s third-biggest economy and meant upside inflationary pressure. “Currently parliament session is on so the government thinks that the time is not appropriate to raise prices, " the government source said. The decision not to raise prices in the current fortnight was taken after a meeting between petroleum minister Jaipal Reddy and finance minister Pranab Mukherjee. Petrol prices were liberalised by the government in June 2010 but diesel, kerosene and cooking gas are still subsidised. The government continues to dictate oil companies’ move to revise petrol prices. The Reserve Bank of India (RBI) sent a strong signal on Friday that its next move is likely to be an easing of monetary policy as risks to economic growth increase, but left its policy rate on hold at a three-year high as it acknowledged high inflation. On Thursday, the rupee was down nearly 20% from a July peak before the RBI took measures to defend the currency, buying rupees in the market and announcing steps to curb speculation. “In view of the (RBI) having taken steps and the strengthening of the rupee, the IOCL management is reviewing the situation and will decide on price revision at the appropriate time," a statement from state-run retailer IOC said. The country’s three state fuel retailers -- IOC, Hindustan Petroleum Corp and Bharat Petroleum Corp -- discuss prices every two weeks and tend to move levels in tandem. The country’s gasoline consumption in the fiscal year ending 31 March, 2012 is set to grow at 5%, its weakest pace in at least six years, as diesel prices are significantly lower and the gap has encouraged fuel switching. Petrol is not as widely used as diesel in India -- accounting for around 10% of fuel demand compared with about 40% for diesel -- but it is high-profile because it powers many of the cars owned by the growing middle class.